I’ve made this several times now, and I keep changing the basic recipe 😉 This time, I brushed the boned leg of pork with smoky BBQ sauce before putting into the cooker, and during the cooking process. And on the advice of the butcher, I took off the skin before putting the pork in the cooker and cooked it separately in the oven for an hour and a half to make a wonderfully crisp crackling (olive oil and salt rubbed in to the skin first). And this time, I also made jalapeno poppers (baked not fried) and baked some ready-to-bake baguettes to serve with the pork. Instead of pulling it apart at the end, I sliced the pork quite thickly and we had it on the hot freshly baked baguettes, with extra smoky BBQ sauce and the jalapeno poppers on the side. The pork was unbelievably tender and delicious (the butcher also said he only ever gets pork from sows as it’s much tenderer and less ‘smelly’ than pork from boars). The jalapeno poppers were good too — I didn’t make the ‘essence’ that’s in the recipe, just added cumin and a Cajun spice mix to the cheese mix. Interestingly, the jalapenos varied in heat — some were quite bland, others very bitey! Four jalapenos resulted in 8 halves — 3 for me and 5 for my DH, which was plenty. 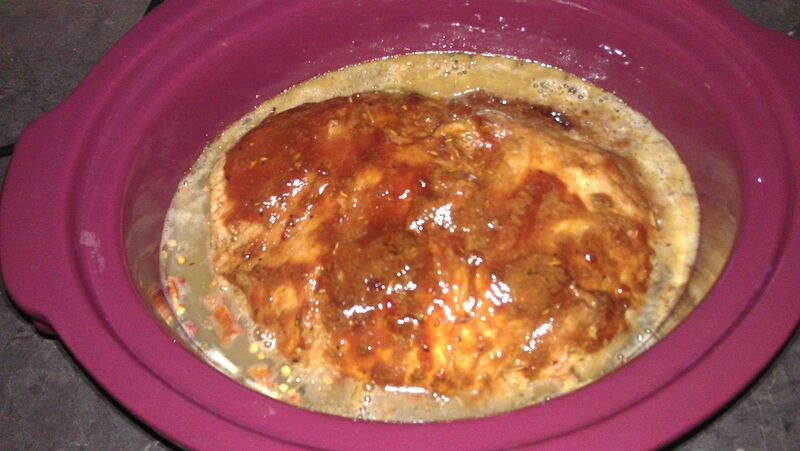 The photo below is while the pork is cooking after a basting of BBQ sauce. It’s doesn’t look very appetising, but it sure tasted good!